While checking out an audiobook from my local library recently, I noticed that they were offering reusable bags for patrons to carry their checked-out materials. This nifty notion (as well as the release of Avatar on DVD) made me remember that Earth Day is quickly approaching. Hundreds of thousands of media titles packaged in plastic cases move through our warehouse each year. We also repackage many titles onsite. Additionally, each year these products are shipped to us on thousands of wooden pallets. Over the past few years, Midwest Tape has implemented a variety of programs to reduce the environmental impact of all this packaging. In 2009, Midwest Tape recycled 200,000 pounds of plastic DVD and CD cases and wooden pallets. We work with local companies that recycle the plastic into pellets that can then be molded into new plastic cases. Our own SoundSafe™ audiobook cases are made of 100% recyclable polypropylene. Midwest Tape mails hundreds of thousands of pounds of Buyer’s Guides and weekly mailers each year. We work with our printer to continuously decrease the environmental impact of the paper and ink content of our catalogs. Our latest improvements have qualified us to display the coveted Forest Stewardship Council (FSC) logo. 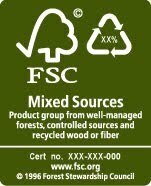 Printed materials with an FSC Mixed Sources label support the development of responsible forest management worldwide. The wood comes from FSC-certified, well-managed forests, from FSC-controlled sources, or from recycled material. In our warehouse operations, we use newspapers that are purchased as publishers’ excess to pack your orders. You may see newspapers from all around the country packed into your boxes to hold your orders securely. What environmentally-friendly efforts does your library make? Is your library doing anything in honor of Earth Day?